This issue occurs because the installation media contains an unattended setup file with an embedded product key. Interrupt installation by stopping Windows virtual machine. Open the configuration of your virtual machine by right-clicking on the virtual machine icon in the menu bar at the top> Window > Virtual Machines list > click Configure. Click the Hardware tab and select Floppy Disk. 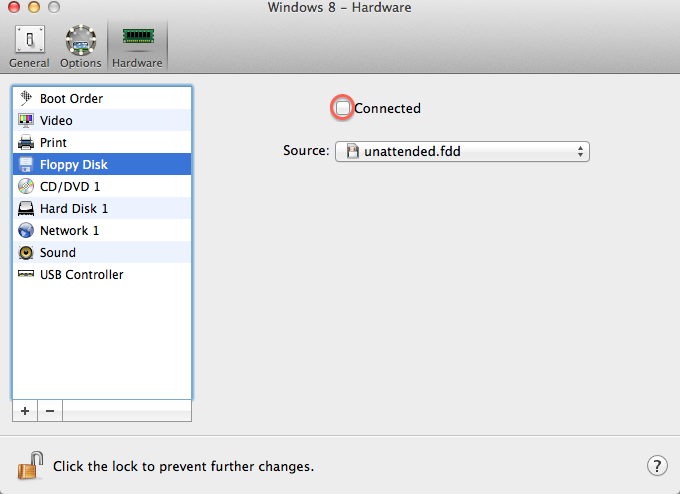 Disconnect the floppy disk by clearing the Connected option, and click OK to save your settings. Once the Floppy Disk is disconnected, restart your virtual machine and new installation attempt should start automatically. In case disconnecting the Floppy Disk does not help please revert to Hardware tab, select the Floppy Disk and then click on button to delete the Floppy Drive. Once the Floppy Disk is deleted, restart your virtual machine and new installation attempt should start automatically. If the solution above does not help please also check the knowledgebase article: 116238.